Another wonderful Seven Sisters retreat has come and gone. We all wonder how our 3 day stay together can end so quickly. We also wonder why no matter how hard we try to pare down the food and projects we bring, we always end up with too much of both! I was working on some secret sewing, so I don’t have many photos to share. I did manage to piece my June mini top and will try to get it quilted this week. And, a little late night mishap stitching! Fotini enjoyed her stay despite her inability to work on anything due to a minor mishap – a broken wrist! The rest of us played Little Red Hen and all took a part in stitching her top together. Kathy will do her quilting magic and it will be ready in time for the wedding at the end of July. Charlotte stitches us all under the table. She is like the Energizer Bunny! Christina can turn the tiniest “discards” into something amazing. I am itching to start one like this! 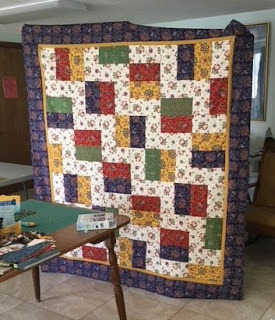 Karen M. was working on her fabulous kit from Missouri Star Company. I forgot to get a photo of the center, it is stunning! 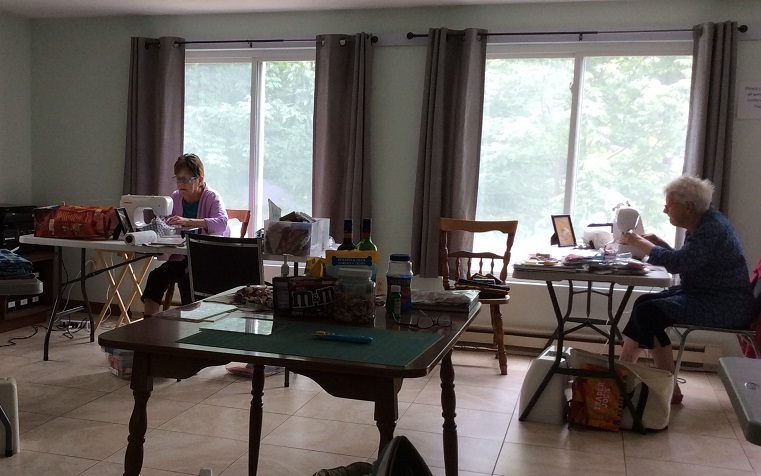 Kathy (on the left) is a creative flea and always works on a dozen or more projects at once. And Karen B. (on the left - aka Susie Karen) was working on some adorable orphan triangle blocks. We try to have a challenge of some sort and last year Fotini had given us a bag with instructions to fill it with "unwanted" fabrics over the course of the year. We dumped them all on the table and we all politely grabbed our favorites! And since there is never enough fabric we all made a short trip down the road to visit Cyndi at The Busy Thimble. If you ever get to Maine you MUST visit. It is the best quilt shop ever!! And, of course we all managed to have fun doing what we do best! 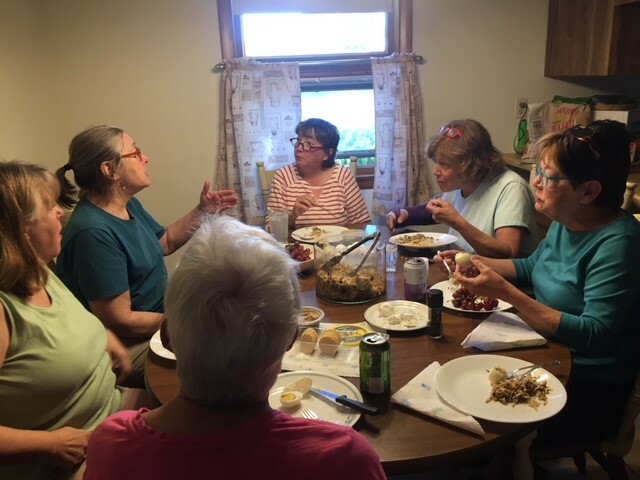 As we said our goodbyes, we decided that our next year's spring retreat would be at the Vermont Quilt Festival. I hope we see some of you there! Sapphire Stars - Home at Last! 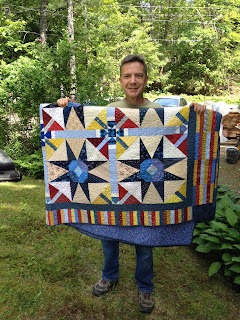 I had such fun following along on Kevin’s (Kevin the Quilter) “Sapphire Stars” mystery quilt! 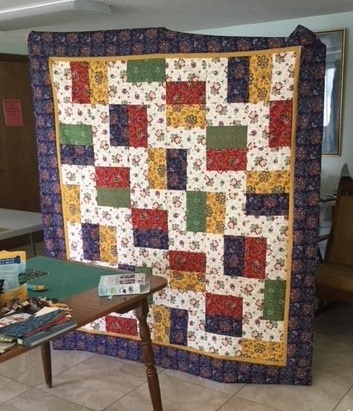 Since I am in charge of veteran’s quilts in my local quilt group, I make quite a few. But, this one was special to extra me and I wanted it to go to someone I love. I missed his birthday and Memorial Day, but I finally got it to him this week. 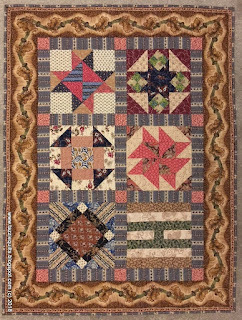 It was beautifully quilted by my friend Kathy Boudreau (no blog). She did a fantastic job! My little brother Sam. Isn’t he cute? Thank you for your service sweetie! And, thanks Kevin for hosting this fun mystery quilt. Hope you do another one soon! Imagine my surprise when I opened this package from Australia and out came this little gem! 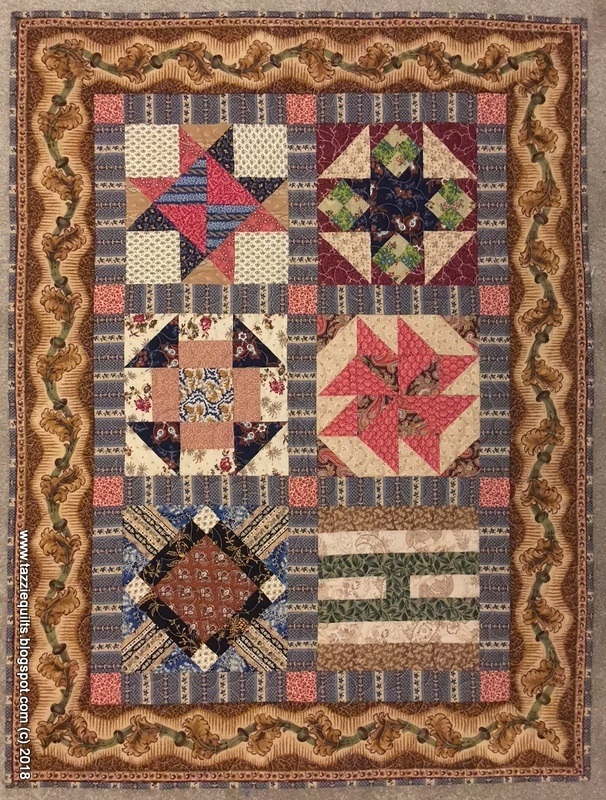 Tara (Tazzie Quilts) made this as a thank you for sending her some 1880's conversational prints she had been searching for. I will be sending her every new conversational piece I find for the rest of my life!! 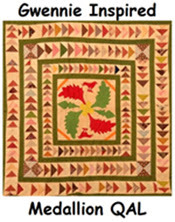 I adore this quilt. I thought I had every reproduction print ever made, but apparently not as there are some in this quilt that I have never even seen. It is so "me"! Thanks a million Tazzie!! (I stole plucked the photo from her blog as the one I took this morning did not do it justice! 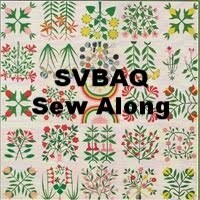 If you follow my blog regularly, you know of my constant quest for the elusive “neon” (20th century term) fabrics of the 1890’s. They were in fashion for such a short period of time and although there were a great many of them produced, they are very hard to come by. There have been a few reproductions over the years – but NEVER enough! I have amassed quite a collection, so it is always fun to find one that I don’t own. I opened my mail last night to see this lovely pile pour out of the package. Wow! 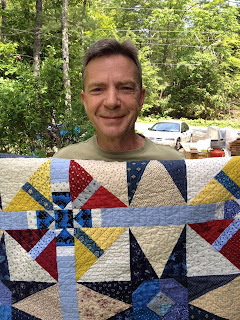 Kevin (Kevin the Quilter) knows how much I love them and actually found one that I do not have. This was from a line done by Pilgrim and Roy and this particular print was my favorite in the line. I have it in green and black, but not the brown (until now). Thanks a million Kevin!!!! I feel so very fortunate to have met so many wonderful people through quilts and quilting. I was sitting at my machine this morning and I noticed that I could see 10 special gifts from friends in this small area! The gingerbread soap is from Janet (Rogue Quilter) I keep it there for the aroma! And, the little 1 ½” squares (my current feeder project) are from Cyndi (Busy Thimble) who gave me 742 at my last visit! And this is but the tip of the iceberg. My entire sewing room house is full of special gifts. For these friends and those not mentioned above (you know who you are) I am extremely grateful!! I think I promised this last month, but I will promise once again to be better at posting these little minis in a timely fashion by the end of June - Wink! 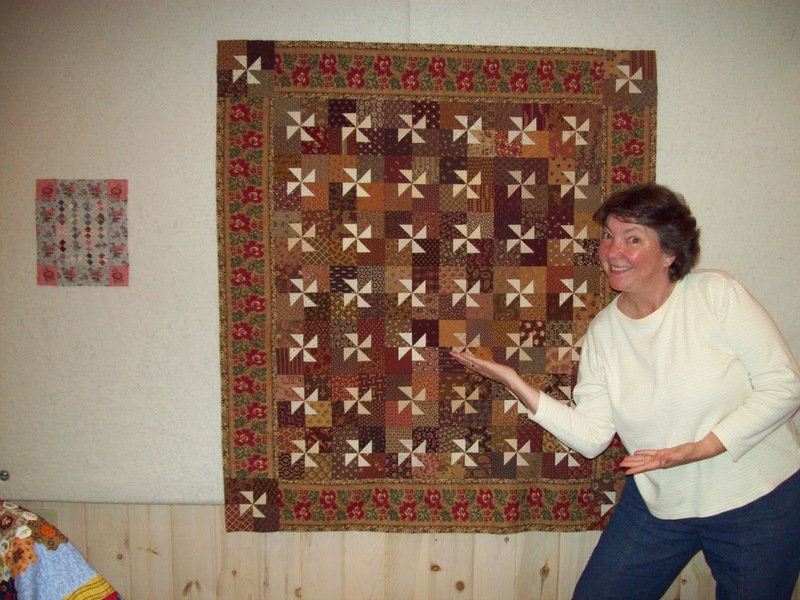 Here's a quilty picture to go with the post since I have nothing else to offer! As I feed the pieces through the machine, I wonder why I’m not accomplishing as much as I’d like to these days. I notice my coffee mug is empty so I run downstairs to get a fresh cup. Wait, is that the dryer buzzer? O.k. just a quick fold before I head back up. Hmm, better throw in another load as I may be upstairs for a while. Oops, dropped a towel off the top of the pile. Argh, how is it I missed the dust under this table? Better do the whole floor over. Vacuum cleaner bag is full again. How can we be out of them? A quick run to the hardware store. Oh, what pretty flowers they have today. I really must look through every box to pick just the right one! I’d better put these in the ground right away, it won’t take long. Wow, that Lily of the Valley has really spread, I think I’ll just move a few out front. The phone rings as I enter the house. “Lunch? 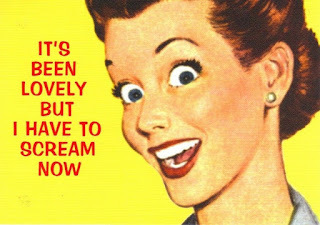 Oh, I’d love to but I am planning on spending the day in my sewing room. She did what? You don’t say………… o.k., catch you later!” Too late to make a salad, just grab some crackers and get back upstairs! Good grief, how could all those crumbs come from one box? Fine, I’ll vacuum now, it won’t take that long. You’re kidding me, I’m sure I bought this brand last time – they don’t fit? Fine, back to the hardware store to exchange the bags. Done! Now back to my sewing! Although, now that I have a new bag in I might as well finish the rest of the downstairs. Who is that at the door? Can’t quite make it out through this window. Oh good, just the mailman. Better clean that window. O.k., that’s it, back to the sewing room. Who turned on my machine? 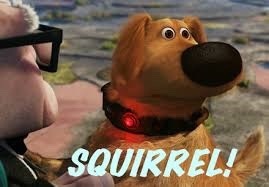 I hear a voice from downstairs, “want me to start dinner?” So…. Does this sound familiar? And, on another “does this happen to you?” note – Do you ever find yourself stitching with the same colors as your outfit of the day? I’m usually lucky if my socks match let alone matching my sewing project!